Someone recently gave me a new set of Tarot Cards. Now, I’m pretty adamant about using the standard Rider-Waite deck that has existed for most of the 20th century. However, I decided to pull today’s card from the new deck, which is called The Golden Tarot, with illustrations by Melissa Launay. I included a shot of the back of the card here, which is also very striking. The card of the day is the Two of Cups. In the Golden Tarot, the image is very straightforward (as it is for all the Cups): there are two elaborate cups on a simple blue background. If I had drawn from my older deck, the man and woman toasting each other with the large cups would instantly clue you in to the romantic message expressed by this card. Whether it’s about an existing love or one soon to occur, or a business partnership, this card is an affirmation that all is well in that relationship. There is and will continue to be mutual harmony in this relationship, so make a toast and drink up! Dale Chihuly, well-known for his creative swirls of glass that are transformed into giant sculptures and chandeliers, has outdone himself with this fantastic show at the Biltmore Estate. Illuminated lights within a plethora of shapes, colors, and unexpected locations throughout the grounds provide a spectacle that is brilliant when the skies darken. Even though I have an issue with an artist who uses others to create his work, there’s no escaping the brilliance of this display. Wherever you have a chance to check out a Chihuly show, do it. You’ll be amazed, and the creative side of your brain will thank you. This is an easy and quick reading that I usually do if I want the answer to a specific question. So, today I thought, what’s going to happen with my job? I know I’ve been taking a lot of time off, but I also know that my students really enjoy my classes and I will be very productive once my life settles down a little (famous last words, eh?). 1. “What am I holding onto?” The first card is The Star, which is a really excellent card no matter where it appears in a spread. Because of all the stars in the sky, the card is considered a celestial or navigation card. It’s not going to give direction, merely point out that I already know what I want and how to get it…so follow the stars! It’s possible that this card is telling me that I have too many stars in my eyes and I need to come down to earth a little, but let’s see what the other cards have to say. 2. The next card, the Queen of Wands, is here to answer “What can I do to let it go?” The Queen of Wands is a very confident woman, sure of her powers and attractiveness, and confident about all aspects of her life. There may be someone who is trying to stop me from using my powers, and that individual is the one I must let go – or else she will hold me back for the rest of my life. Boy, do I know who that is…my so-called mother-in-law (you can learn scads of stuff about her in “Freeing the Magician”). 3. So obviously, the next question asks, “How can I take control again?” Who wouldn’t want to get back on track after messages that are tantalizingly good, except for one teensy-weensy thing. The 8 of Pentacles shows a hard working man finishing up a job. The message is straightforward: work hard, be your best self, and everything will be alright. 4. “What do I Need to Do to Move Forward?” The 9 of Pentacles is a wonderful card, and the woman in the card is advising me to take care and enjoy life, now that my work is done. Completing a job, doing it well, is the best way to gain satisfaction and stability. Or at least I hope so. So, there you have it. Short (kinda) and sweet. We’ll do a longer one soon, I promise. No kidding, I saw two guys with daggers very similar to this one sticking out of their dead bodies recently. One had blood pooled all around his head and in his lap – the knife was in his neck, and the other was pretty cleanly stuck in his chest, meaning it was stuck there after he was already dead, so it was a message. For me. Placed on a lovely white couch in the Pierre Hotel. At least the couch wasn’t ruined, but I noticed it disappeared and was replaced with one in a yellow and white linen pinstripe the next day. All of these events are pretty well described in “Embracing the Fool,” with me being the Fool in this case, as you may have guessed. I’ve held similar daggers, some of which had a very nice curve in the blade, mostly for self defense purposes when I was traveling with the circus and later, doing my dissertation research. A girl can’t be too careful! Knowing how to throw and use a dagger is a handy skill to have. But I didn’t kill either of the men I referred to above. 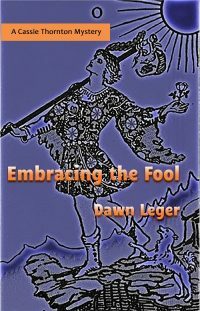 In “The Fool,” I used a gun to kill, when it became necessary. Self defense, of course. Here’s an example of a curved blade dagger. Pretty, isn’t it? Until the sheath comes off.